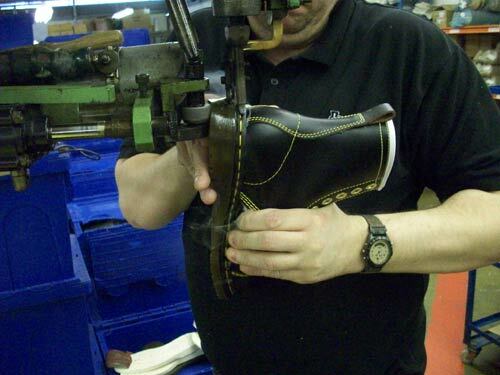 Last week I was lucky enough to spend the morning at the Dr. Martens factory, which is about an hour north of London. Oh my word, it was a most excellent experience. I was unaware that Doc Martens were still making footwear in the UK and only had a slight idea of the rich history behind the brand and their range of products. 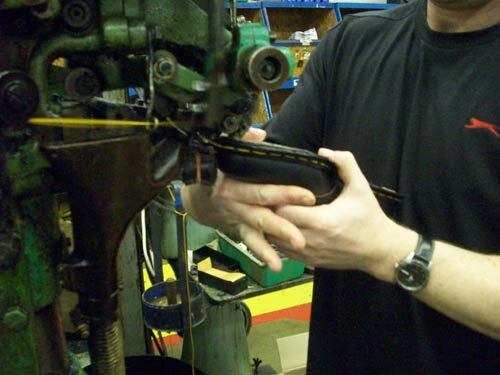 Dr. Martens produce several styles of shoe in their Northampton factory, which is attached to their development department and recently opened ‘heritage centre’ a building that celebrates the 50+ years that Doc Martens have been available. 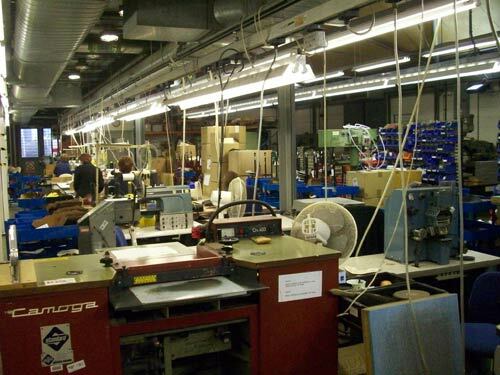 Unlike many other footwear manufacturers, DMs make the entire shoe, or boot, on the premises. Every product they make in the UK starts out as raw materials and through a half-dozen or so processes in the same large room, comes out as a fully formed piece of wearable UK heritage. To see the shoe or boot take form is an almost magical experience and hopefully the following images and videos will help you understand why DMs are worth taking note of. 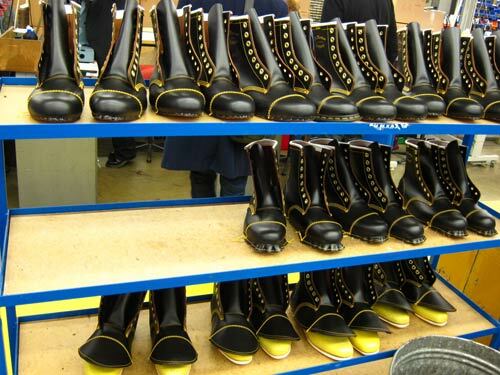 nce inside the factory, the first process is to create Doc Martens’ famous air filled shoe sole. 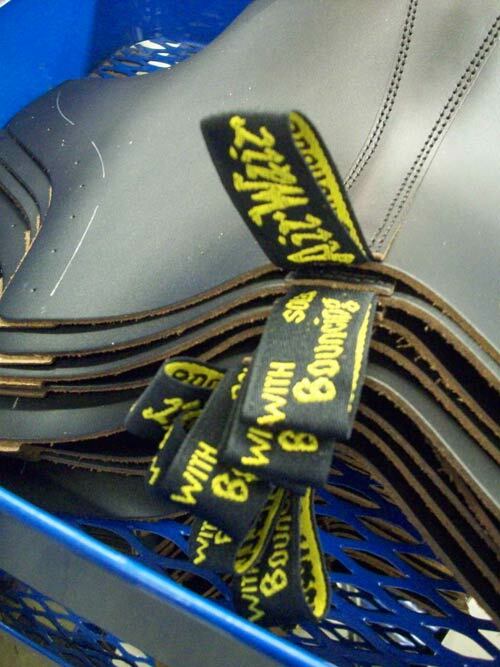 You may have seen the black and yellow logo ‘Air Wair’ text that forms part of the Dr Martens logo; this pertains to the air trapped inside the heel of the plastic sole. The original Dr. Martin, a German man, hurt his foot in a skiing accident. 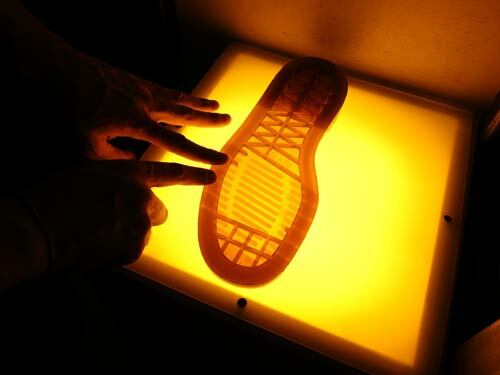 He came up with the idea for an air filled sole to help him recover. All Dr Martens footwear starts off as tiny granules of plastic. These are fed into a hopper and down into a very hot injection moulding machine. You can see the metal form below that the plastic is fed into. 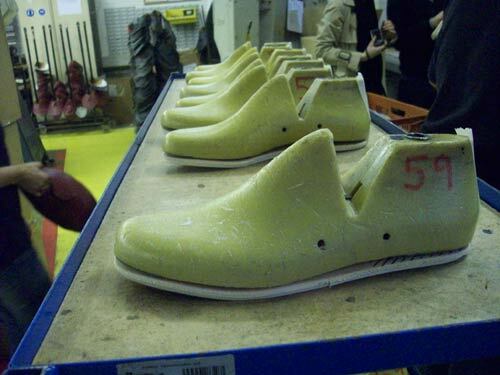 Each sole is then quality checked for irregularities. 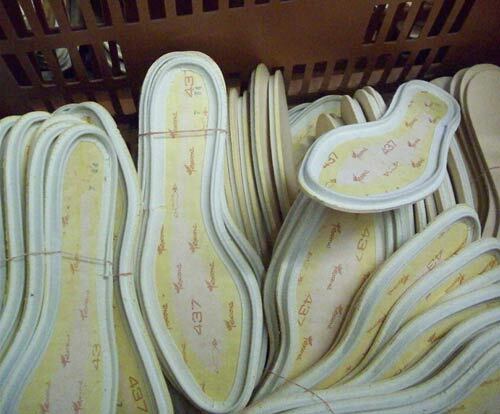 If there are too many air bubbles in the sole, it is rejected and if possible recycled back into the production line. To cut the leather for each shoe, the team is equipped with these industrial cookie cutter things. I joke, they’re called ‘knives’. These sharp metal shapes cut the pattern from the leather. The leather arrives at the factory from a tannery. Each piece is huge and finished so that it pretty much resembles the leather on the final shoe. 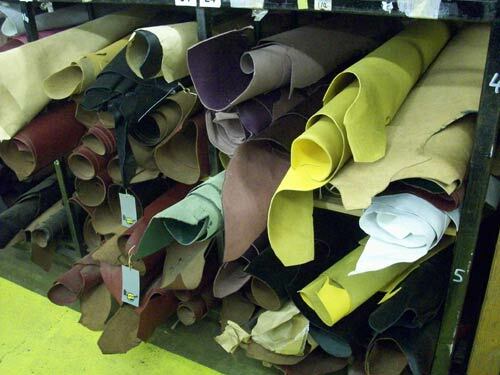 These huge pieces of leather are dyed in various colours. A skilful worker is employed to cut the patterns from the leather. In this video you can see that a Clicking Machine is used to press the shapes from the leather. A lot of care is taken to ensure that almost no leather goes to waste. Now that the sole of the boot and the leather pieces that make up the upper have been manufactured, the process of piecing it all together can begin. The leather is passed on to a team of skilled seamstresses who first skim off a thin layer from the underside of the leather to prep if for sewing, you can see this in the video below. Following this, the leather is sewn together with big industrial machines. I’ve done a little sewing in my time and I can tell you that these women are very impressive - they make very accurate joins very quickly. Small holes are cut in the leather to form eyelets for the laces. Eyelet studs are fired into the leather to create the metal hole that the lace runs through. The machine that does this is fierce! 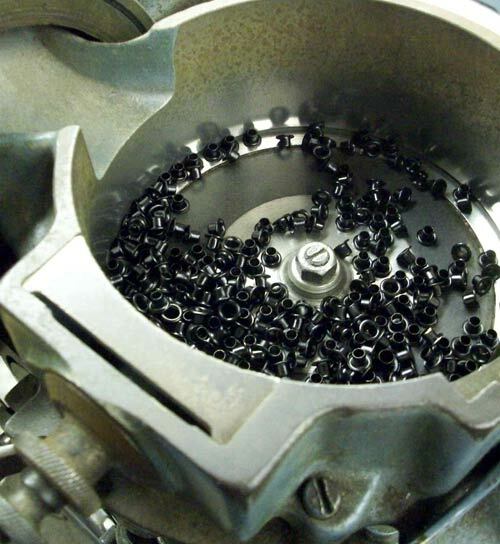 The studs are fed into the machine from a hopper, along a belt and into a punching head. This thing is like a machine gun! 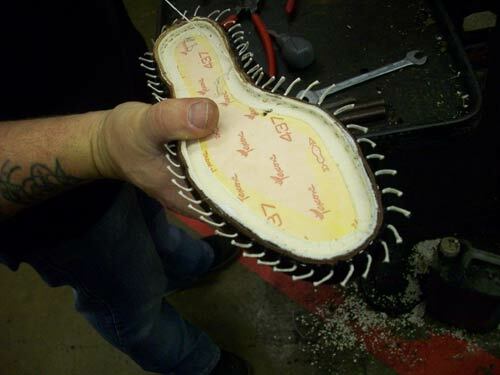 At this point the inner sole of the shoe is fitted. this is a soft fabric sole that your foot sits on. Even though the wearer of the shoe will hardly notice this piece, it’s all most the most important component; all the parts of the boot are fitted around this piece. Interestingly, DMs made in the UK are branded with a gold inlay. This gold foil is transferred onto the innersole heel. Doc Martens made outside the UK will not have this gold inlay. This is how you can tell you’re getting genuine home-grown product from Dr Martens’ - take a look inside; if it’s gold, it’s British. 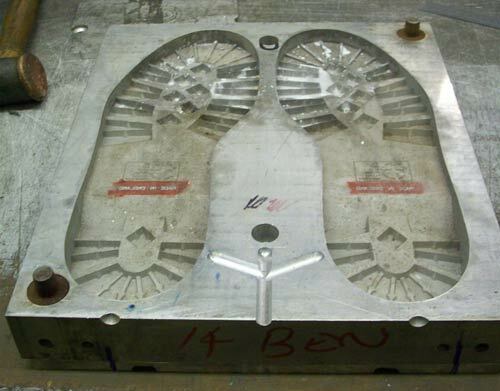 Now that the components of the boot are coming together, the boot needs to be fitted to a ‘last’. This is a rigid form that the soft leather fits around tightly. 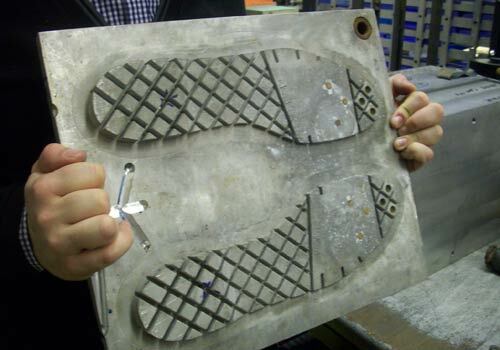 This helps give the boot form and will make the following processes possible. There is a different set of lasts for each shoe size. The next process was, for me, the most impressive. 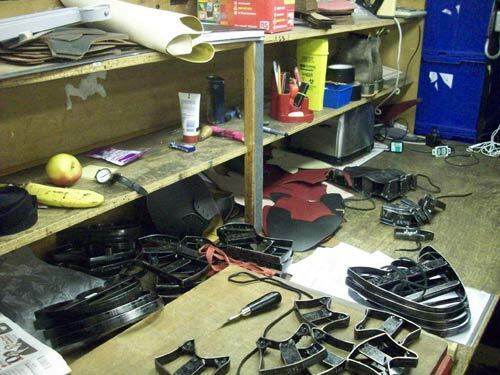 The leather upper is heated inside a sort of ‘shoe toaster’ until it is malleable then fitted to a heat forming machine. 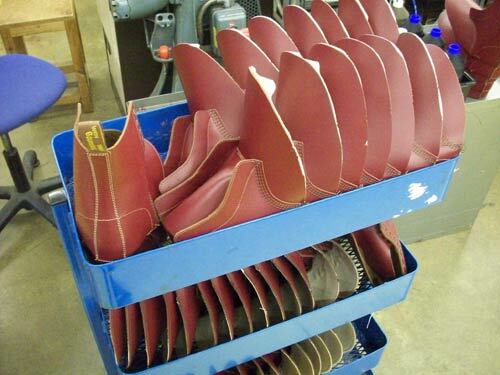 This machine stretches and shapes the top leather into the recognisable shoe shape. Take a look at the video below, it looks as if the shoe is being inflated! Great machine. Now the product is really starting to take shape. I find it interesting that the shoe still doesn’t have a Doc Martins ‘look’ to it at this stage - the all essential sole needs to be added. These images make me wonder what a DM shoe would look like with a thinner, more elegant sole. The sole is sealed to the upper with rubber a coping. 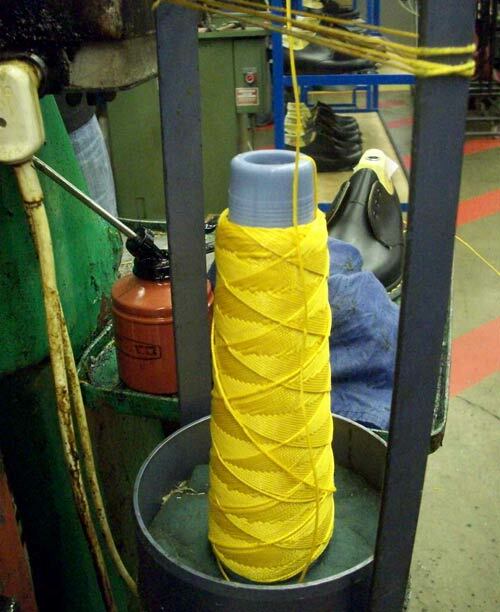 The rubber is supplied in a long coiled strip, which is kept in warm soapy water to keep it supple. The coping is fused to the sole by a heated process. It’s a this point that the famous yellow stitching is added. 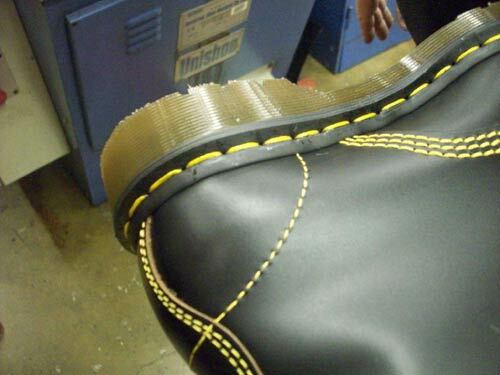 Once it’s been coated with hot wax to make it weather proof, the tread is fed into the leather to create the yellow stitching that is synonymous with Dr Martens. Unfortunately the pictures here don’t show you how fast this man is working. In a bright flash the rubber is passed through the machine and a wheel on the underside presses the sole up into the heat. The pressure and the heat fuses the pieces together. If a mistake or a fault in quality is spotted at any point throughout the production line, each process is designed to ensure the that it can be undone and the product passed back up the line to start again. In this picture you can see how the underlying stitching can be undone if an error is found. The rubber coping is simply applied again. Almost the final stage of the production is demonstrated here. This seriously sharp piece of metal cuts grooves into the heel of the boot. These ridges are another iconic detail to the Doc Martens design. Once the lasts are removed from the boot, the final stage before they are boxed up and shipped out is a quality check. Careful eyes look over the finished boot, sponge it down and add the laces. Tags and stickers are also added. hed boots - these ones are called ‘Cappers’ and take inspiration from a classic work boot. Note the triple stitching on the quarter. These are vintage 1461 3-eye shoe in Oxblood. Dan, who showed us around had a pair of these and absolutely pulled them off. 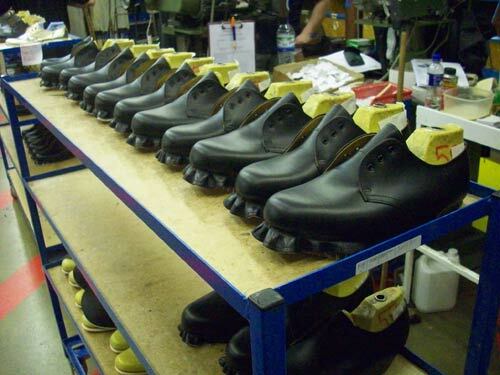 These Dr Martens where made in the UK by British hands. They’re based on a design that’s stuck true to it’s 50 year old roots. Doc Martens are worn by all demographics and have an everlasting appeal. Until I’d seen how they are made and met the passionate people who make them, I underestimated DMs. Now I’m a total convert and I hope this post goes some way to convincing you. As well as the immensely interesting factory, Dr. Martens have a heritage centre which showcases some of their rich history. 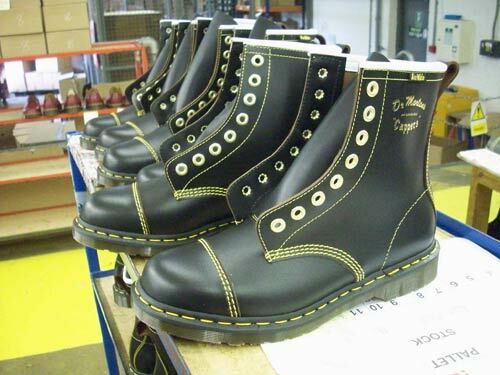 This has already been an unusually long post, so I’ll bring you some history of Doc Martens in the future.